Valves are rhombic to broadly elliptic, scarcely heteropolar. Ends similar and protracted, rostrate-apiculate. The axial area is narrow and linear. Central area unilateral formed by a 1-4 shortened striae. Opposite the unilateral central area is a long stria that terminates in a single stigmoid positioned near the proximal raphe ends. 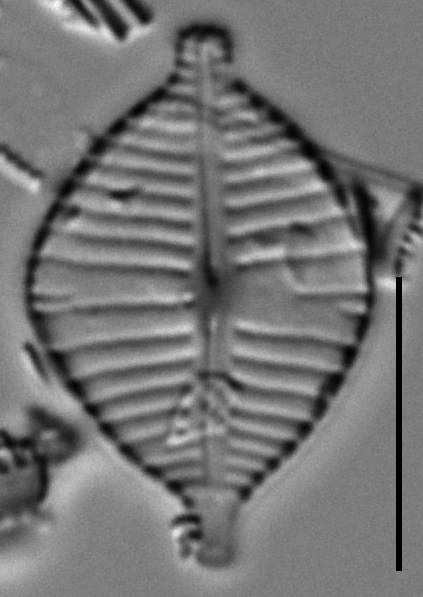 The raphe is filiform, and slightly arched. The proximal ends are barely expanded, while the terminal ends are indistinct. Striae are widely spaced (more widely spaced in the valve center) and mostly radiate throughout, becoming nearly parallel near at the head and footpoles. 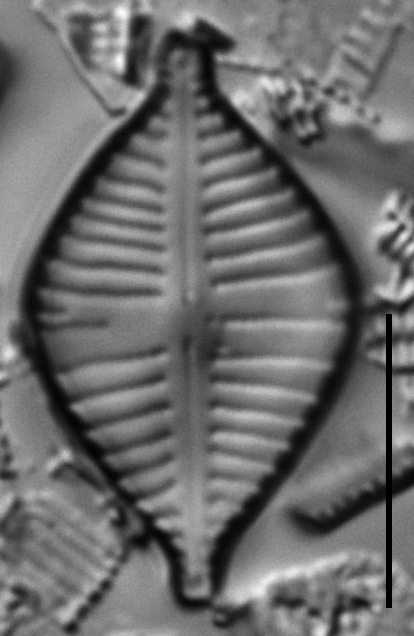 Striae are punctate, and the areolae difficult to resolve, 25.0-28.8 in 10 µm. 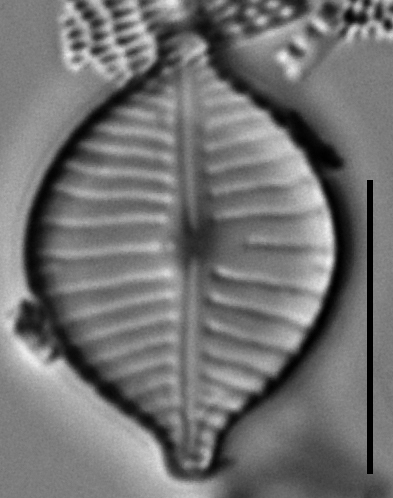 An apical pore field is present, but is indistinct. 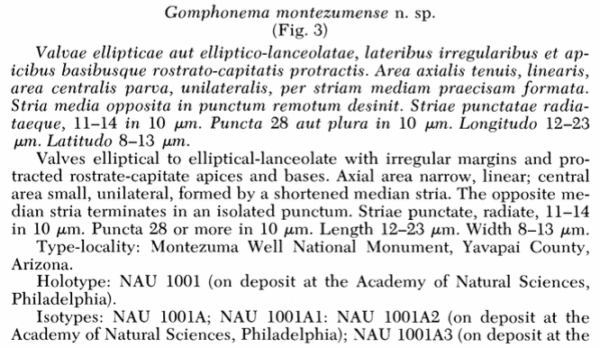 Gomphoneme montezumense is apparently an endemic, known only from the Montezuma Well National Monument in Arizona. It lives in the epipelon or epilithon. Physical and chemical conditions suggest the well is a stable calcium-bicarbonate thermal spring with an elevated level of sodium chloride. The annual temperature range is 16-26°C. Water quality data are presented by Czarnecki & Blinn (1979): SiO2 = 22 mg/l; Ca = 106 mg/1; Mg = 43 mg/l; Na = 46 mg/l; K = 5.75 mg/l; Cl = 37 mg/l; HCO3 = 680 mg/l; pH = 6.6-6.8. 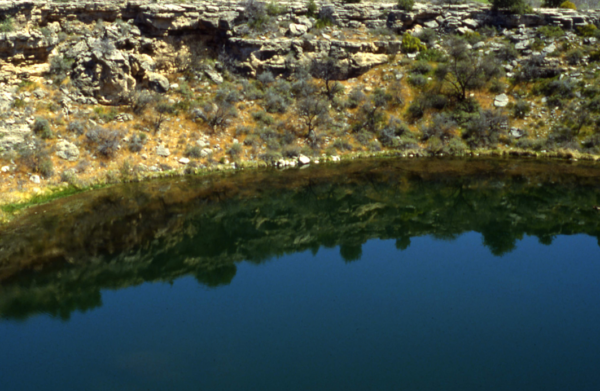 Montezuma Well National Monument. 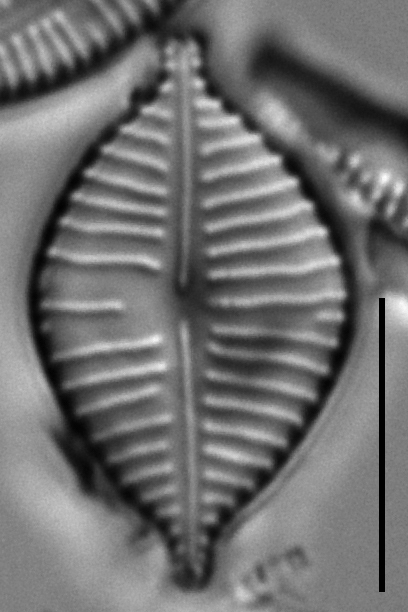 Only known locality for Gomphonema montezumense. Valves elliptical to elliptical-lanceolate with irregular margins and protracted rostrate-capitate apices and bases. Axial area narrow, linear; central area small, unilateral, formed by a shortened median stria. The opposite median stria terminates in an isolated punctum. 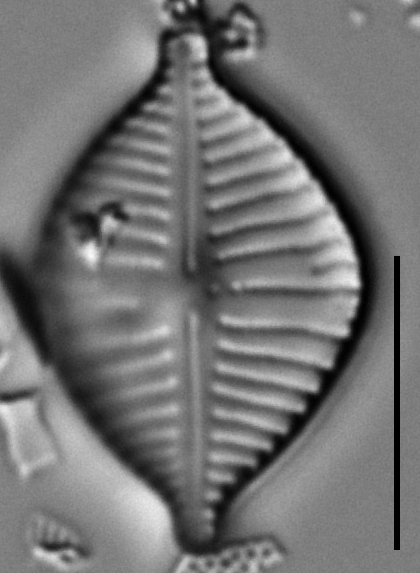 Striae punctate, radiate, 11-14 in 10 µm. 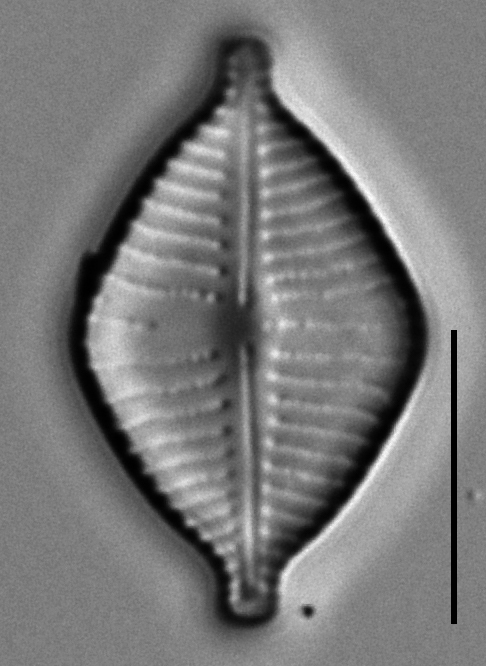 Puncta 28 or more in 10 µm. Length 12-23 µm. Width 8-13 µm. Valves are rhombic to broadly elliptic, and scarcely heteropolar. 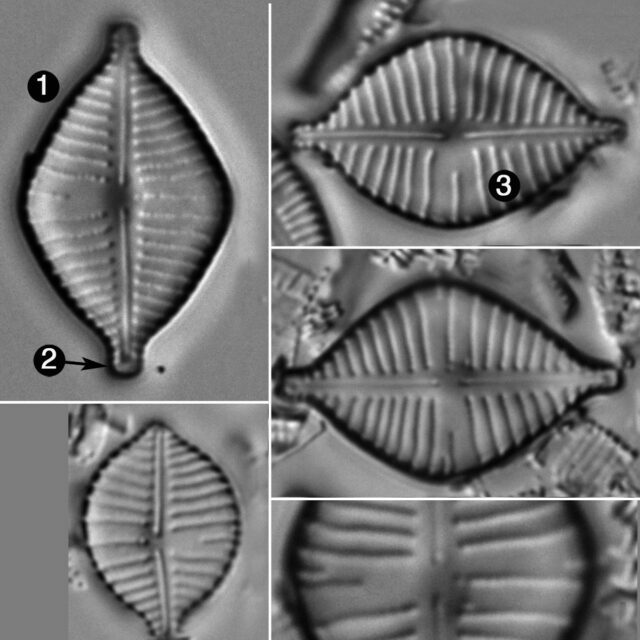 Striae are widely spaced and radiate throughout. 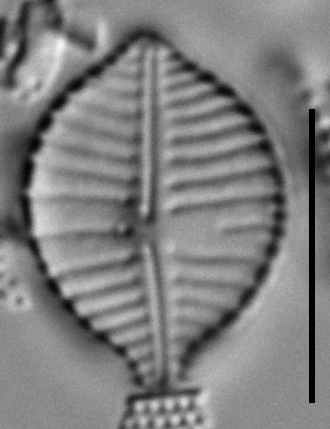 An apical pore field is present, but is difficult to distinguish.